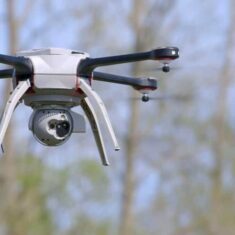 Aeryon Labs is the small Unmanned Aerial System (sUAS) provider at the center of major world events and international media stories. 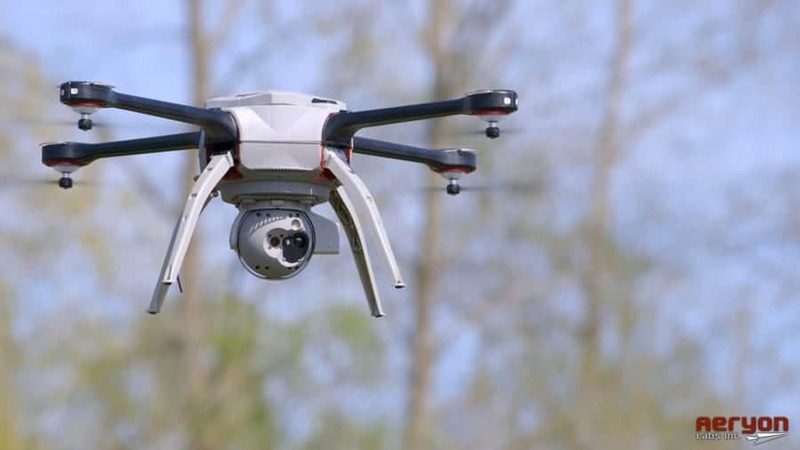 A recognized technology and industry leader, Aeryon Labs is the trusted partner of civil and military customers, resellers, and other commercial business partners around the globe. Aeryon sUAS set the standard for immediate aerial intelligence gathering by anyone, anywhere, at anytime, for a wide range of military, public safety and commercial applications. 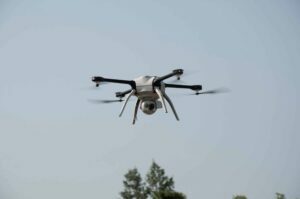 Aeryon sUAS are Vertical Take-off and Landing (VTOL) systems – ideal for providing continuous eyes-on-target for situational awareness, operations in confined environments, collection of precise and detailed imagery, and low-risk launch and retrieval without peripheral equipment. 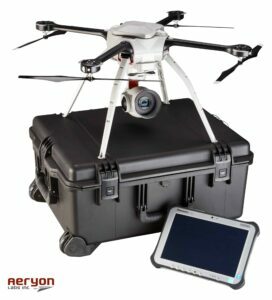 The Aeryon SkyRanger is a rugged quadrotor sUAS platform designed to government and military specifications, with fast, accurate and high-performance aerial imagery and data capture capabilities. The SkyRanger sUAS features single-user VTOL operation without the need for any launch or recovery equipment, and can reliably perform in even the most demanding weather conditions, comfortably operating in environments too confined for fixed-wing UAVs and manned aircraft. The innovative pre-assembled folding design protects the payload and can be assembled in seconds. 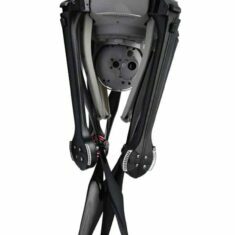 The payload, battery and UAS limbs are all easily field-replaceable with no requirements for specialized tools. The intuitive touchscreen control interface requires minimal user training, allowing the operator to control navigation and cameras, and access dynamic fight plan mapping software. The SkyRanger and its integrated imaging payloads enable the reliable and repeatable collection of high quality imagery and data. Payload capabilities include dual EO/IR cameras, 60x digital zoom, as well as onboard target tracking and digital image stabilization. The all-digital 256bit AES encrypted network provides streaming video to multiple devices. Integrated radio relays, low-latency video streaming, fleet management and other technologies expand the uses for this easy-to-deploy UAS. 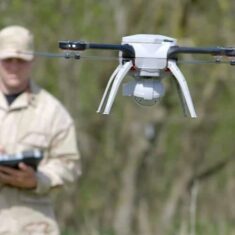 The Aeryon SkyRanger sUAS is ideally suited for a wide range of applications, with different specifications available for both civilian and military markets. This multifaceted solution enables more scalable and sophisticated UAS deployments – in military, public safety and commercial applications. Comprised of complementary solutions – AeryonLive Video and Telemetry and AeryonLive Fleet Management. AeryonLive Video & Telemetry gets the right data to the right people, at the right time, enabling prompt and accurate decision making. 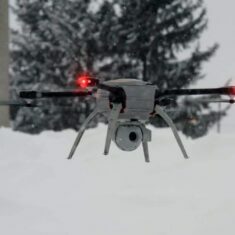 This integrated solution streams live video and aircraft telemetry from an Aeryon SkyRanger, Lightbridge supported DJI system, or any HDMI/SDI based video source across a secure, reliable bonded cellular network connection. There are also secure deployment options – choose between cloud-based infrastructure or on-premise (physical) server. AeryonLive Fleet Management automates online reporting to ensure that operations remain compliant with internal practices, airspace regulators and insurers – especially for larger, geographically-dispersed fleets. 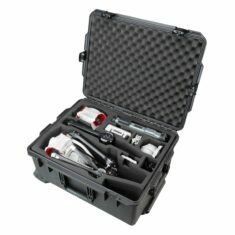 The Aeryon HDZoom 30 is a ruggedized, high-performance electro-optical imaging payload that provides HD video as well as still image capture up to 20 megapixels. With a 30x optical (60x enhanced digital) zoom lens, the HDZoom 30 is ideal for a broad range of applications that require clear and precise image capture. 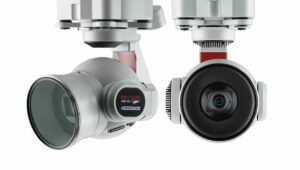 Integrating seamlessly with the Aeryon SkyRanger™ sUAS platform, the 3-axis stabilized HDZoom 30 enables precise, accurate performance even under the most demanding of conditions. Potential commercial and industrial applications include close inspection of buildings, power lines, cellphone and radio towers and many other such facilities that may be located in hard-to-access or hazardous areas. 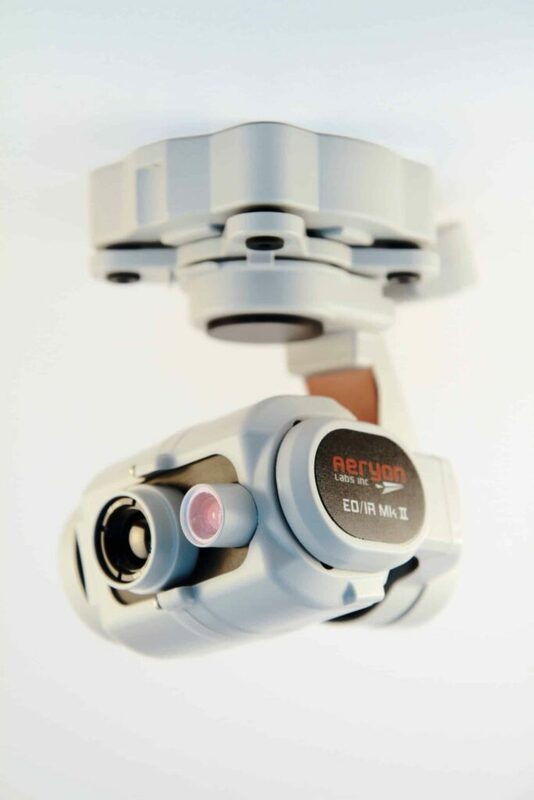 Aeryon’s imaging solution ensures results that are fast and accurate as well as cheaper and safer to obtain than via conventional manned methods. The Aeryon HDZoom 30 has also been designed for Tactical ISR (Intelligence, Surveillance, and Reconnaissance) applications, allowing operators to track and capture targets in great detail while remaining safe, secure and covert. Digital Image Stabilization (DIS): onboard video stabilization. The Aeryon EO/IR Mk II is the next-generation multi-sensor imaging payload for the Aeryon SkyRanger sUAS. 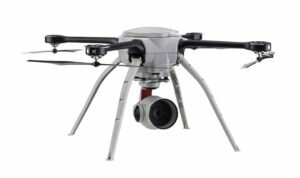 Delivering high-definition daylight and thermal imagery in a weather-resistant, 3-axis stabilized gimbal, the EO/IR Mk II provides critical infrastructure inspectors, public safety agency and first responders anytime/anywhere, immediate aerial intelligence. Choice of IR lenses – 19mm focal length (tactical applications) and 13mm (thermal mapping or SAR applications). Designed to capture high-resolution, precise images and video, the EO/IR Mk II can also be deployed with optional onboard image processing capabilities. The Vector™ embedded computing platform automates the identification and tracking of moving targets, as well as maintain a fixed hold on stationary objects while the aircraft is repositioned. 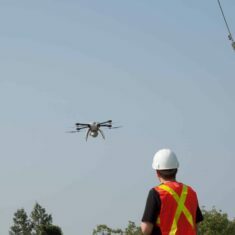 Aeryon sUAS have always been easy to use and control, but in certain applications finer positioning control is a requirement. Now, with the Aeryon Joystick Controller, pilots who need it, can have more precise control. Designed to be all-weather and rugged, the Joystick Controller matches the weather-resistant capabilities of the Aeryon sUAS platform and can be used in nearly any condition. This custom-built Joystick Controller fits securely around an Aeryon-provided Mission Control Station (MCS) tablet and is designed to easily be resized to fit smaller tablets. With the Joystick Controller connected to your tablet, it can perform all the basic functionality that you are accustomed to with MCS software interface, and since the tablet fits into Joystick Controller the view of the tablet screen is not affected. Pilots are able to see the map view and video feed as usual. With the ability to make finer positioning movements, the Joystick Controller is ideal for taking off and landing in confined locations or where GPS connectivity is poor – enabling even more flexibility for projects and tasks in extreme environments. The Joystick Controller also supports multiple control modes, making it even easier to match your in-field experience. By submitting this form, you consent for your details to be sent to Aeryon Labs and its authorized partners in order to respond to your inquiry. Depending on the location of the organization, your personal information may be transferred and processed outside of the European Economic Area.